New blurry eyesight or loss of vision is almost always serious. A doctor's exam is needed right away. Pain in the eye can also be serious. If eye pain is more than just mild irritation or discomfort, a doctor's exam is needed. 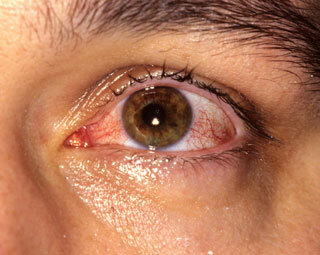 Viral conjunctivitis is a common eye infection caused by a virus. The main symptom is eye redness. The eye may also itch and feel irritated. Sometimes there can be some eye tearing or a white discharge. It is more commonly called pinkeye (because the white of the eye is pink-red). It can occur with a cold. It usually is not serious. Take out your contacts. Switch to glasses until your eyes are better. This will help prevent any harm to your eye. Clean your contacts before wearing them again. Throw away used contacts if they are meant to be thrown away. Do not rub your eye(s). Rubbing your eye(s) can cause a scratch on your cornea. Pinkeye is very easy to spread to other people. You can spread it by shaking hands. Try not to touch your eyes. Most cases of viral pinkeye are mild. It should get better in 7 to 10 days. No antibiotic treatment is needed. Eye redness may simply mean that you have left your contacts in too long. Eye redness can also happen if the contacts do not fit well or if you are allergic to the contact lens solutions. Sometimes eye redness can be the first sign of a more serious problem, like an infection. Do not wear contacts when your eyes are red or irritated. The redness and irritation should go away over the next 12-24 hours. If it does not, you will need an eye exam. The doctor will want to check for an infection, a corneal abrasion, or an ulcer. Eye irritation can be caused by even mild substances. Some common causes are perfume, eye make-up, smoke, and contact lens cleaner. The main symptoms are eye redness, swelling, watering, and pain. Wash the face, then the eyelids, with a mild soap and water. This will remove any chemicals or irritants. Also try to avoid the irritant in the future. Rinse out your eyes with water for 2-3 minutes. Slowly pour lukewarm water into your eye(s) from a pitcher or glass. Or, put your head under a gently running faucet or shower. Keep your eye open while you do this. If it does not, you will need an eye exam. The doctor will want to check for a corneal abrasion (scratch) or other problem. This patient had viral conjunctivitis, also known as pink-eye.